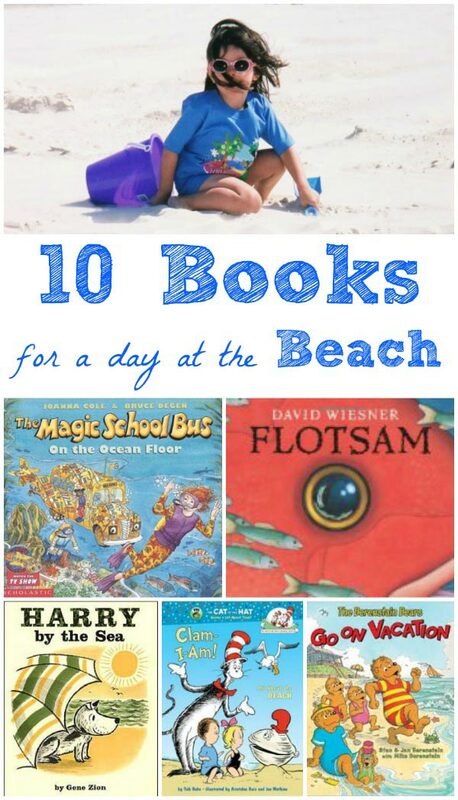 Wonderful books about the beach and lake that are perfect for that summer reading list! There are SO many things to do at the beach! Have you tried any of these Science at the Beach activities? But a day on the sand or at the lake can tire out even the most active of kids so be sure to bring along a few books for the trip. Or better yet, take them in the car for some before-beach fun. 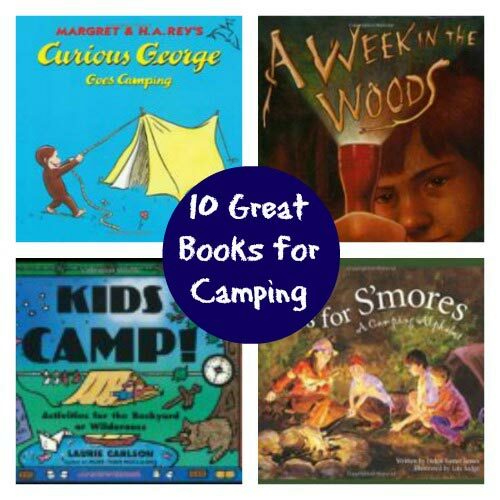 Kids can learn a TON while digging in the sand or floating on the water and these books will inspire them to explore items they may find and enjoy some downtime on the blanket. I'm including both fiction and nonfiction reads (since some kids will gravitate toward a story while others enjoy learning 'the facts') along with affiliate links for our choices so you can learn more about each of our selections. • Pack the books in a plastic bag to keep them away from any wet suits or towels you might be carrying on the way home. • Challenge your kids to read/play/read/play -- use the books as a way to keep them busy when you want them out of the sun for a little while. • Be prepared for kids who want to 'act out' the story! Some will read a book about shells and want to go on a shell hunt. My kids hear about Harry and want to act like sea monsters :) Let them have fun with it. Learn about starfish, crabs, jellyfish, seagulls and more in this Cat in the Hat Learning Library book that features all kinds of creatures that can be found at the beach. Some of the science and nature topics also include tips about seaweed, drift wood, tide pools and waves. A must read for anyone visiting the beach this year! This wonderful Let's-Read-and-Find-Out Level 1 science book is wonderful for younger kids. Kids love looking for and collecting shells on their visit to the beach. This book helps to enlighten kids on what types of creatures call a shell a home and how they use or find these homes. Our favorite dog, Harry, travels to the seaside for a vacation. While on his vacation, he in entangled in a patch of seaweed and mistaken for a sea montster. The Berenstain Bears are headed to the seaside for a family vacation. Travel along as the Bear Family swim, fish, build sandcastles and explore the town! Kids will enjoy comparing their own family vacation to the beach with that of the Berenstains. A beautifully illustrated, wordless story about a boy who visits the beach in search of 'flotsam' - anything that floats and has been washed ashore. The boy discovers all kinds of treasures but none more facinating than an underwater camera with some amazing photos! This story will appeal to kids of a wide age range (ages 3 - 11 years) as they search for patterns and details in the book. Kids will love discussing all the amazing things they see in each picture. If you have a camera on your trip, let them take some photos of their own 'flotsam'. Go on another amazing field trip with Ms. Frizzle and the class as they explore the depths of the ocean. Kids will learn about coral reefs, water vents and various plant and animal life along with the class. One of the more stand-out books in the series, the reader is introduced to many things in great detail using fun and interesting facts. A young boy carves a small canoe and rider out of a piece of wood. He names the rider Paddle-to-the-Sea and sets him off on a journey in the Great Lakes. Paddle travels through all five Great Lakes, up the St. Lawrence and out to the Atlantic Ocean. He meets a number of obstacles and some helpful people along his trip. This is considered an advanced picture book so better for the older set (ages 8+) as both a read aloud story or one they read on their own. An award-winning story that highlights nature and geography at its best! Two siblings travel to the country to spend the summer with their cousins. While there, they discover a forgotten lakeside resort that has been hidden away from the world. What will they find as they being to explore the old ghost town? One of my favorite 'vintage' summer stories with a nice combination of adventure, mystery and independence! A great summer read-aloud for kids of all ages. Four siblings set off for summer vacation at a cottage near a lake with their mom and stepfather. While there, strange things begin to happen when the children make wishes but they can't quite control what they wish for -- which is where the fun begins! This sequel to the book "Half Magic" is highly recommended as a read-aloud for any age. Older kids will enjoy reading it on their own too. This new series by Carole Marsh incorporates some great non-fiction information into a fictional mystery story. Climb aboard a boat that travels through all the Great Lakes and encounters many mysteries at lighthouses, shipwrecks and islands along the way. My kids really loved these books especially for places we would visit on vacation since the locations and geographic details included are part of the true element of the story! Kids will also enjoy learning some fun facts about our Great Lakes!